"The building of the Manitoba marks a significant achievement in Canadian industrial history in a number of ways. For one, the Manitoba would not only be the largest steel steamer afloat on inland waters, but she would be built by the first Canadian shipyard equipped for steel shipbuilding. From an industrial archaeological point of view, the Manitoba was the starting point of steel shipbuilding in Canada." Franklin Bates was married in 1879 to Emma A. Woods who died at the young age of 25 in 1885. Of their three children, one, Florence Grace, survived to adulthood. In 1901 Franklin married Bessie Stephen Thomson. There were four children from this marriage, Margaret Lois (1902-1933), architect Franklin Murray (1903-1978), Gordon (1905-1908) and Alan (1907-1908). Franklin died unexpectedly in 1907 just as plans were being developed for expansion of the Toronto yards. Biography of Franklin Bates Polson. Emma A. Wood, born in Brighton, Cobourg County, in 1860. Her family came to Cobourg in 1870. Married Franklin Bates Polson in 1879, which union produced a son and two daughters. The daughters survived her death at the age of 25 in 1885. Bessie Stephen Thomson (b. Toronto 1878 - d. Vancouver 1973) was the ninth child of William Thomson (b Dundee, 1831) and Betsy Gibb Stephen, (also of Dundee). William Thomson was for a time President of the Toronto Board of Trade, and a Director of the Northern Railway. Bessie married Franklin Bates in March, 1901. This marriage produced Margaret Lois, (b. 1902 - d. 1933), Architect Franklin Murray (b. 1903 - d. 1978), Gordon (b. 1905 d. 1908) and Alan (b. 1907 - d. 1908). 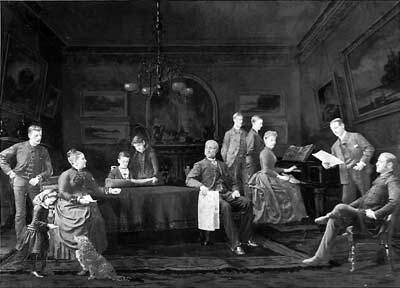 Thomson Family Portrait circa1884. Bessie is the girl feeding Jock, the dog.